Getting hurt is inevitable in life. Whether you’re accident-prone or just not paying attention, you know the misery that can come with an injury. But, injuries don’t have to happen when you’re working out. In the past, you’ve seen a lot of guys get hurt while working out. They might have been doing CrossFit and pulled a shoulder muscle, or deadlifting and hurt their back. Getting bigger muscles and greater strength, with bad form, can lead to a lot of damage to your body. It may even lead to death. So, to answer this growing problem, the fitness industry introduced “corrective exercise”. This exercise model includes core training and mobility warm-ups, to make sure you’re doing everything properly and won’t injure yourself. But, prevention is the better option. If you know proper form before working out, you won’t need many corrections. Once the damage is done, more often than not, you’ll see flare-ups of pain from the injury later on during your life. What are some ways you can keep your body healthy and injury-free? Glad you asked. Here are 5 tips to prevent injuries. If you’re attempting to deadlift, do squat movements, or press, you’ll want to make sure your back stays flat. The lower part of your spine isn’t meant to bend, so when you’re exercising you’ll want to make sure that it isn’t rounded or arched. You may want to have a friend check your posture or stay in tune with how your body is feeling. By bending your spine or arching it, can lead to horrific lower back pain. Lower back pain can show up when you’re sitting too long or standing too long or even lying down. As your back dips in on your bed, pinpricks of pain will make relaxing a lot less pleasant. On your back, small movements may produce pain. If you don’t have someone around to give you feedback while working out, then you’ll want to videotape yourself and make any corrections. Though there are many differences between being sore and being in pain, sometimes they can feel the same. 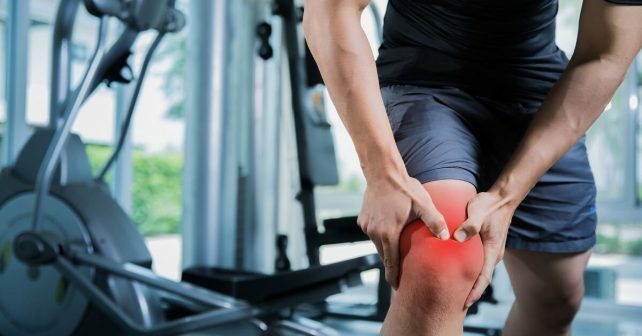 Present after exercise, a condition called Delayed-Onset Muscle Soreness (DOMS), sets in. DOMS means you’ve exercised well and your muscles are just feeling the burn. Pain feels quite different than muscle soreness. If you’ve lifted weights that you’ve never tried before, did more reps than usual, or just used incorrect form, you may feel pain deep in your lower back. Often, this pain will be accompanied by numbness or tingling that may spread to your legs. This is not soreness, this is a pending injury. If your bench-pressing and you feel a dull pinching sensation in your shoulder, you may be damaging your rotator cuff. Another instance of pain versus soreness is irritation inside of a joint. The burn should be within your muscles, not in the area around them. All of these issues should not be taken lightly and you should see your physician to determine if there’s any damage. Once an area of your body is damaged, it will continue to be irritated and the pain will progress. You also may be reluctant to stop exercising because you don’t want to lose momentum. Pushing through the pain isn’t good for your body and it doesn’t make you stronger. What you want to have before beginning a workout are alternative exercises. For instance, if back squats hurt your back then do front squats or leg presses. Rather than bench pressing with the bar, dumbbells can give you similar benefits. For a great workout, turn your palms into face each other. These alternate exercises will let your injured areas recover and get you back to your best. You may be impatient when you going to the gym or when you’re doing other exercises. You may want to see the maximum benefits in the least amount of time. But, your body takes time to build muscle or to burn fat. If you go too hard, too fast, you’ll risk injury. Gradual increases of poundage or reps are recommended. For example, if bench-pressing is your go-to, then each week you should add around 3% to 5% more poundage. This may seem like you’re not trying hard enough or even get some flack from the other guys, but by adding just 5 pounds every week, you can increase your squats by 260 lb in a year. Your body needs opposite resistance to stay healthy. If you bench press, you’ll want to balance that weight with chin-ups or rows. By pulling, when you’re finished pushing, this will keep the amount of strength gained proportional, and lessen stress on other muscles. To keep your shoulders healthy when bench pressing, you need to increase the strength of your upper back and rear delts. With both of these stronger, they can support your shoulders. Make sure you match the opposite resistance both in weight and reps.
For example, if you bench press 215 for 10 reps, and you weigh 190, you’ll want to add 25 pounds of weight before doing 10 reps of chin-ups or rows. This 215 lbs of pull will counteract the 215 pounds of push. Repeat this method for biceps, triceps, and hamstring and quad lifts. When you push your sets passed your limit, you’ll be “rewarded” with more reps and bad form. Working out with bad form is asking for an injury and little benefit. Instead of working out until your body’s about to break, it’s better to quit one to two reps before the maximum amount you can do per set. This will help your body recover faster, prevent injuries, and this lower intensity can be balanced by higher frequency.